The first Bhaya ship embarked on a voyage through spectacular Halong Bay in 2007 and became a trendsetter for ship service here. Bhaya Limited Company always serves Oriental-style luxury cruise ships. With 8 large and luxury boats and 97 passenger cabins, Bhaya is regarded as the largest and the most well-reputed operator in Halong Bay cruise. Keeping Bhaya as a pleasant company, you definitely undergo a luxury and unforgettable cruise. 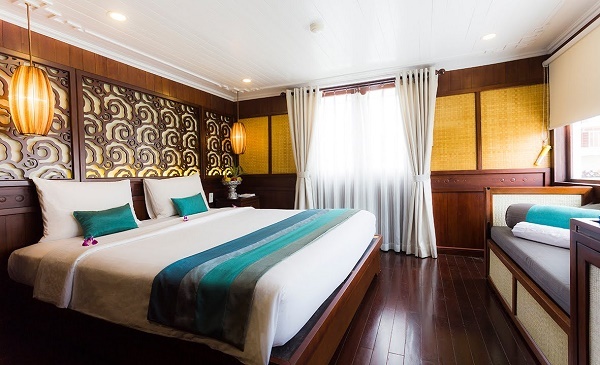 Why is Bhaya Cruise a wise choice to discover charming and magnificent beauty and have memorable experience in Halong Bay? To services in Bhaya Cruise, people have to use the words “excellent” and “high standard” or “superior” to describe. The staff is well trained to have ability to speak English and professional style. They always welcome and serve their “god” with a warm, friendly attitude. If they have any problem, they are willing to support you at any time in anywhere. So memorable is Bhaya Cruise that many travelers expect to come back here in the future. Besides accommodation and staff, what leave the strong impression to tourists are onboard and offboard activities. 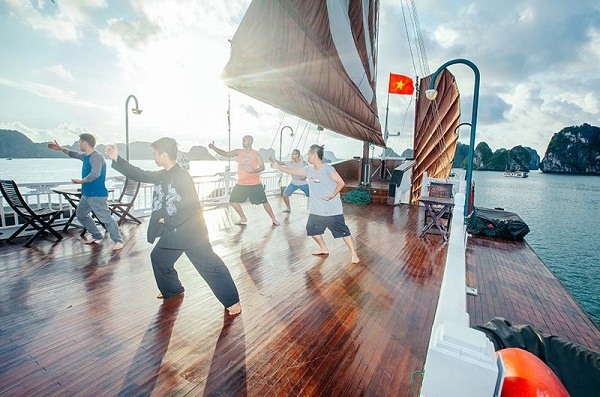 It sounds great when you wake up in the early morning, stand on the ship’s sundeck and take part in Tai Chi activity – exercise. You can feel the fresh and cool air in Halong bay and start a new exploring day with full energy. Furthermore, Bhaya Cruise provides the spa service with modern facilities and skillful staff to customers. It is strongly believe that after a spa, a relax feeling will spread the whole body and all your stress from daily life will disappear. During the day, Bhaya takes responsibility for assisting you in discovering the glorious and chanting beauty of Halong Bay. At mid- night, one activity which can excite you much is squid fishing. Let’s try it one time. Some offboard activities include kayaking, swimming and fish catching. 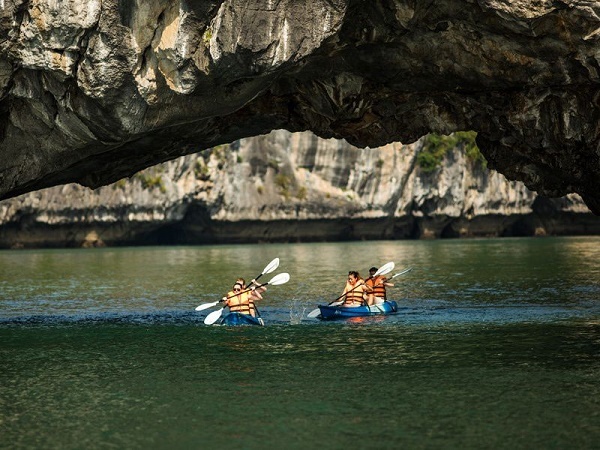 Kayaking is a famous activity in Halong Bay for adventurous people in which they sail a small boat to explore some hidden corners of the bay. Swimming in Halong Bay is considered a valuable experience. You can dip yourself into the clear cold emerald water and immerse yourself into the nature so that you cannot forget the tired days and feel more and more relax. 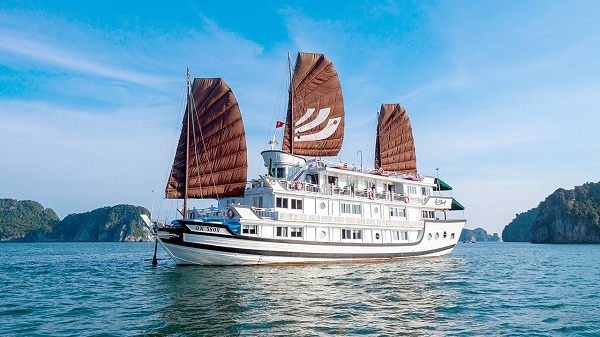 Coming to Bhaya Cruise, tourists can have the chance to explore North Vietnamese tours right on the ship through invaluable lessons from cooking classes. Tasting some Vietnamese foods on the ships can make you love more Vietnam culture. Bhaya Company offers customer 2 type of tours: 2 days 1 night and 3 days 1 night. Even though you book any tour, you can receive the best services there. In addition, booking the tour from Bhaya Cruise is extremely simple via many ways such as online booking, direct booking or phone one. There always are staff members supporting you and meeting your requirement. Honestly, value for your money when you deliver it to Bhaya Cruise. Many visitors to Halong Bay have tried it and what about you?